The ripening process: Understanding the molecular mechanisms responsible for the genetic regulation of fleshy fruits is a major objective of current research for fruit improvement. Fleshy Fruits are divided into two main categories depending on whether the ripening process is controlled or not by the gaseous phytohormone "ethylene". Climacteric fruits such as tomato, apple, pear, and banana are characterized by a ripening-associated increase of respiration and the production of ethylene. By contrast, non-climacteric fruits, such as grape, orange, strawberry and pineapple lack this ethylene-associated respiratory peak. The signaling pathways that drive the ripening process in the non-climacteric fruits remain elusive although the combined action of ABA (Abscisic Acid), auxin, and sugar is suspected to be instrumental to the ripening initiation. In our lab, we use grape as non-climacteric model to characterize the influence of these different plant growth regulators with a particular focus on regulatory genes that trigger the major genetic reprogramming associated with the entry of grape berries to the ripening. Using the microvine system (Chaib et al., 2007), we are currently validating the function of several genes involved in the signaling of Auxin (Auxin-Response Factor 4), sugar (HXK2), and ABA (NCED1, 2). We are currently conducting gain and loss-of-function studies on these genes using the microvine system combined to an inducible promoter to induce or silence their activities. We will verify in the impact of altered expression on the timing of ripening initiation at the onset and we will examine whether the fruit composition at maturity stage is affected. ​The specific interplay between ABA, auxin and sugar is a critical component of the ripening initiation but the effects of other plant hormones and genetic regulatory processes like epigenetic regulation are also explored. For instance, little is known about the role of Histone Post-Translational Modifications. Plant-Pathogen interactions: Crop losses due to pest and diseases are a major threat to incomes rural families and to food security. The growing human population will require a significant increase in agricultural production from staple food to more marginal crops economically valuable though. Changes in the climactic and environmental conditions are leading to the appearance of new diseases whereas genetic changes within pathogen have resulted in the loss of effective sources of resistance and making the increasingly ineffective use of fungicides and pesticides a major concern for the sustainability of the environment of agricultural ecosystem. In this particular context, the identification of new resistance genes is mandatory. ​This will only be possible by a better understanding of the plant-pathogen interactions in order to produce either by conventional or molecular breeding new crop varieties that will carry a full or partial resistance without affecting other agronomically important traits. The interactions between a plant and its pathogen involve two-way communication by the ability of the plant to recognize and defense itself against a pathway and the capacity of the pathogen to circumvent the biology of the plant or to use it to its own benefit. Among pathogens, plant viruses are extremely harmful to the production of vegetable, fruits, and cereal crops. In the lab we are studying the effects of Grape Leafroll-associated Virus on transcriptional and post-transcriptional gene regulation in grapevine. There is increasing evidence for the role alternative splicing events as a potential immunity strategy developed by plants to mitigate the spread and the impact of virus. We are currently interested in using the CRISPR technology in conjunction with the microvine. The concept will be to precisely prevent or promote the expression of transcript variants for potential viral resistance genes that were found to undergo differential alternative splicing events when infected by GLRaV. Signaling and communication in plants: Long-distance signaling and communication between different organs of a plant is essential not only for the development and growth of the plant body, but also to adequately respond to unfavorable growing conditions. Higher plants coordinate and integrate the growth and development of their tissues and organs via sensory systems that result in the production of chemical and electrical signals that are transported from one part of the plant to another. We are using two main plant models in the lab to study this topic. The first one is grapevine because of the extensively use of rootstock/scions in grapevine production. Several aspects of grapevine production including water stress, nutrient deficiency (Nitrogen, salt exclusion), and soil-borned disease relies on the use of rootstock and scion. However, genetic basis that confer drought and salt tolerance, excessive vigor, and disease resistance. Root-to-shoot and shoot-to-root communications are extremely relevant in such developmental context and in response to abiotic and biotic stresses. The use of trans-grafting procedure using grafted microvine genetically engineered for major chemical, nucleic, protein, and physical signals is explored to characterize the nature of these communications. The second model is Brachypodium Distachyon. Our research question is oriented towards the influence of strigolactone, a plant hormone, on the control of root and shoot branching and the likely interplay of this class of regulators with other hormones. ​New plant breeding techniques (NBPTs) like genome editing have recently received the attention of the plant scientific community because it may result in major breakthroughs for crop improvement. In grapevine, CRISPR-Cas9-mediated gene editing is of special interest to target regulatory genes that negatively impact economically important traits. Grapevine genes that confer susceptibility to Powdery Mildew or genes that are associated with the synthesis of off-flavors like methoxypyrazines are being considered good candidates to develop gene edited grapevine varieties resistant to PM and methoxypyrazine-free. Marker-free genome editing technology, which is the delivery of a ribonucleoprotein complex without plasmids and insertion of a foreign DNA, is by far the most promising technique because it does not fall in U.S. under GMO regulations. There are several constrains for marker-free genome editing in grapevine material. It is possible to deliver a pre-assembled ribonucleoprotein complex (CRISPR-Cas9) that targets the gene of interest into “naked” grapevine protoplasts (plant cells without cell wall); but plant regeneration from grapevine protoplasts is almost impossible. The second barrier is the relatively low frequency (6-7%) of editing events in the cell population. The final bottleneck is the lack of selection marker as a means to screen for gene-edited cells from non-edited cells making the screening very tedious. The use of embryogenic cells from which plantlets can be regenerated will address the first constraint. We have developed a project for direct delivery of a modified Cas9 protein used in microvine embryogenic cells and therefore amenable for plant regeneration. Our objective is to develeop. 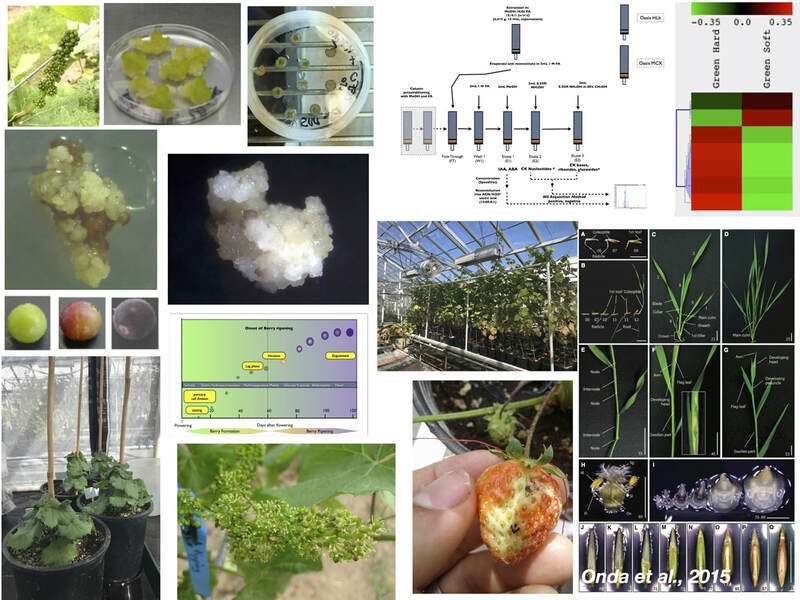 Here, we propose to develop a DNA-Marker Free Genome Editing method in grapevine that can address the issues of marker-free editing as well as regeneration of plants from engineered cells. The use of existing microvine model at OSU, for which streamlined methodology to generate embryonic cells and plant regeneration techniques are in place in our laboratory can be extended to other clonal propagated crops.